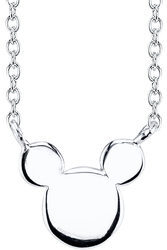 Beautiful officially licensed Disney necklaces collection. All your favorite characters and themes, set into quality sterling silver, and elegantly crafted. 30 day satisfaction guarantee! Officially licensed Disney necklace. Metal weight is 1.2 grams. Pendant measures 9.65mm x 10.32mm.